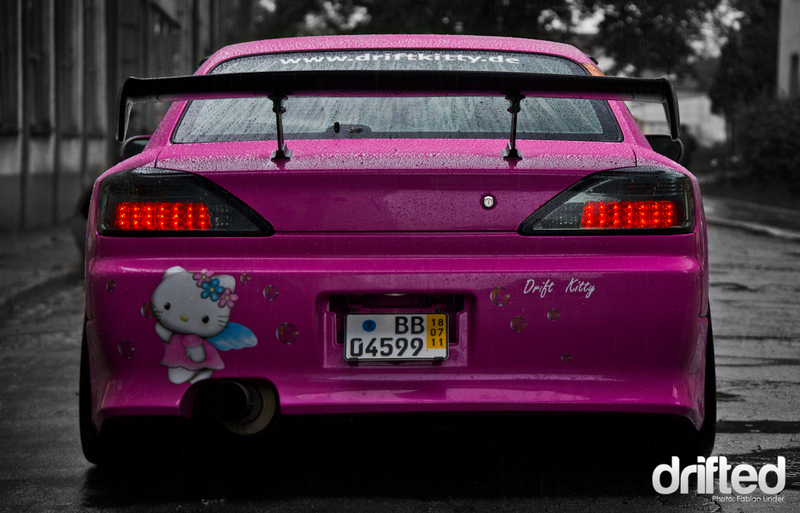 After she sold the Skyline in 2008, she was looking for a good base for a “Hello Kitty” project. 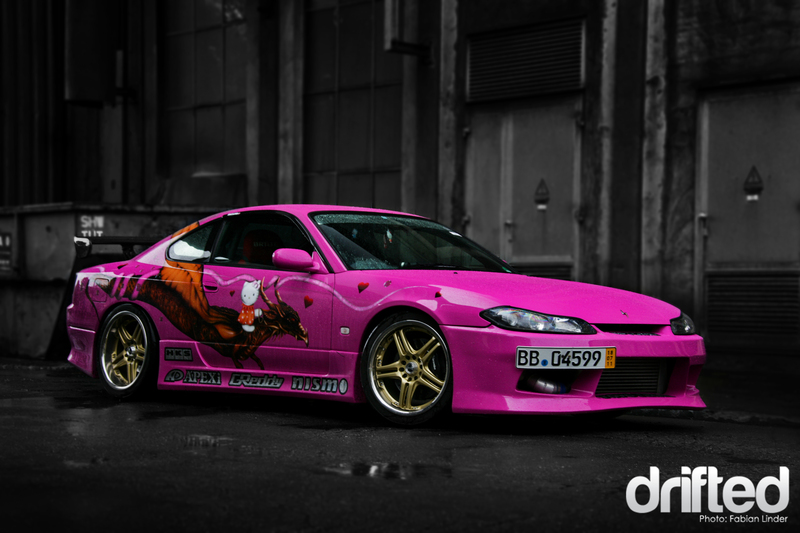 She bought a yellow S15, but swapped the yellow one for a red one a month later, because the red one was already equipped with some drift goodies. 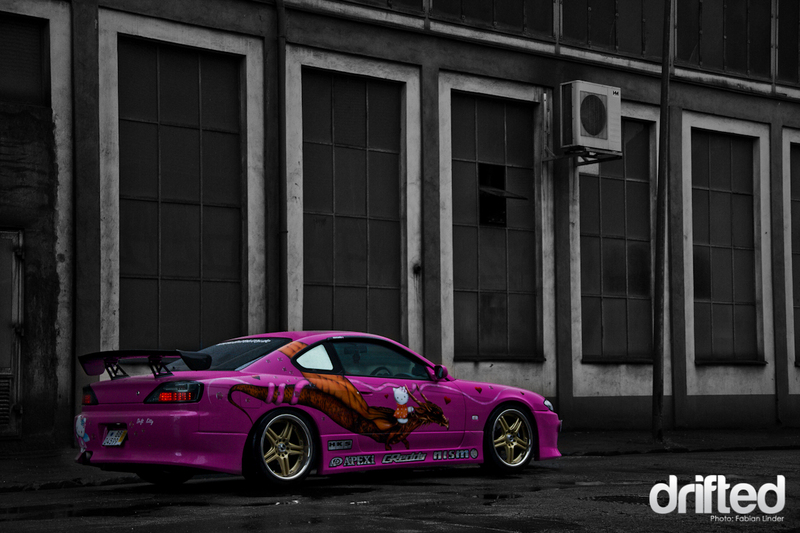 The car had some minor modifications on the engine, a roll cage, a complete Apex N1 setup and a FMIC. 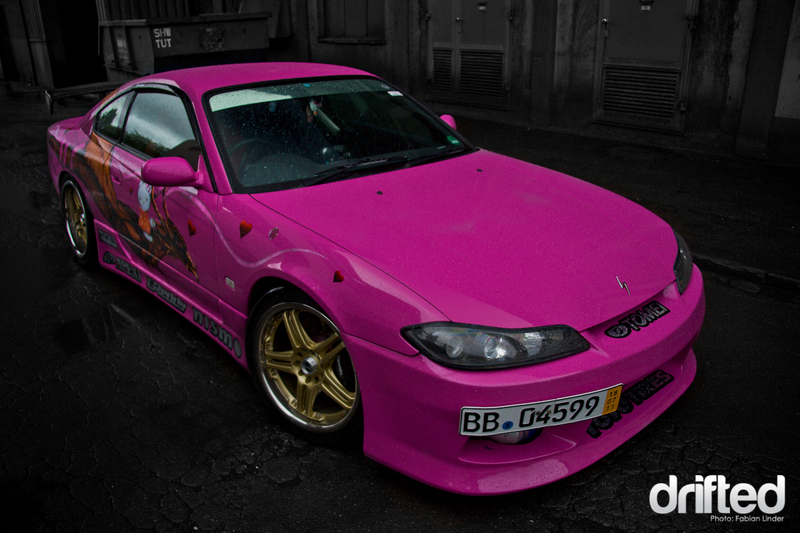 Soon after the S15 arrived, she started transforming the red sleeper into a pink show winner. 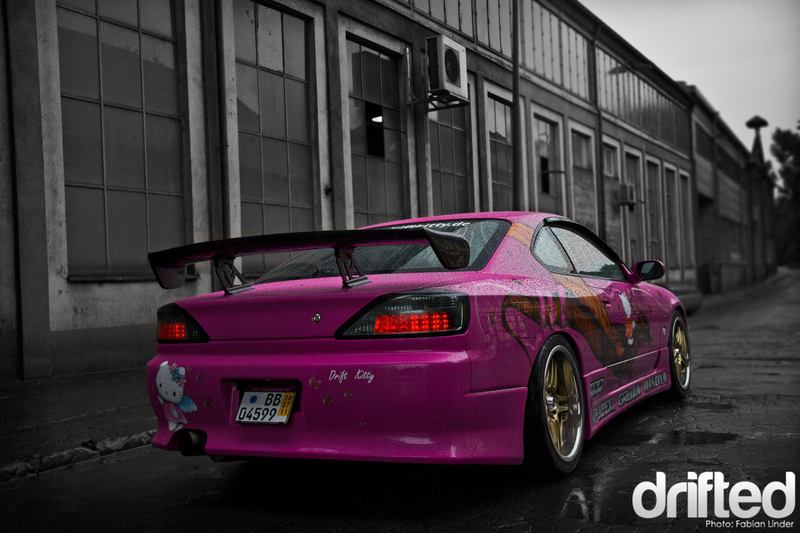 She brought the S15 to the paint shop and prepared it for the painting. 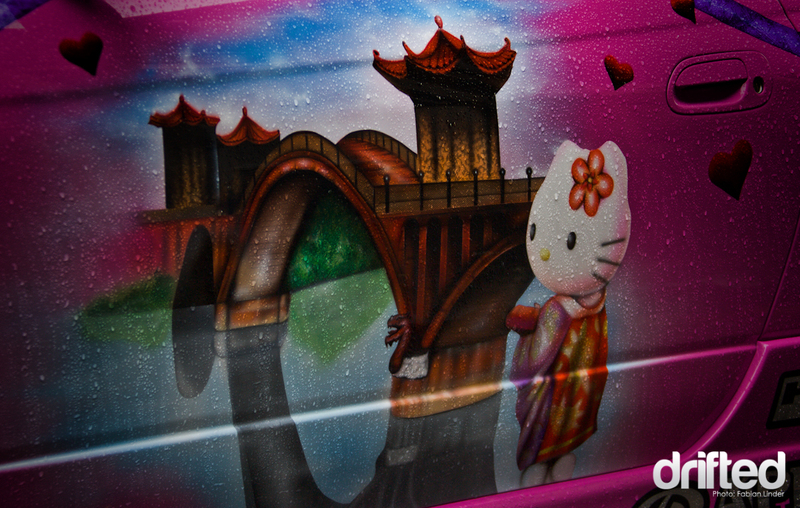 The design was meant to be created in vinyl, but after it didnt look as expected, she decided to go for airbrushing. Her dream base paint was the yashio factory pink, but since the colortone is a well guarded secret, she decided to go for a similar tone. After the paint was done she had to hurry to make it to the seasons first expo. They finished the day before the exhibition started. 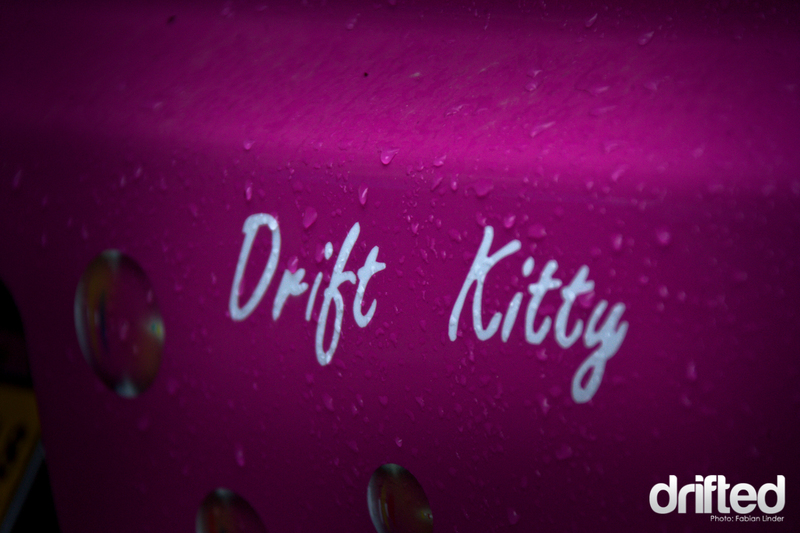 The 2009 season ended on a Hockenheimring trackday when the piston rings decided to quit on her. Now it was about time to swap the engine, and a bunch of RB30 engines from Australia had just arrived at Andys garage, so they decided to go for an RB30. After another season the first RB30 give up because of hard conditions (bad mapping, bad oil flow, hot temperature) on the Nürburgring, so another engine was needed. After some troubles, the couple split up, but stayed close friends, so Andy did his best to build up a new engine setup for her. 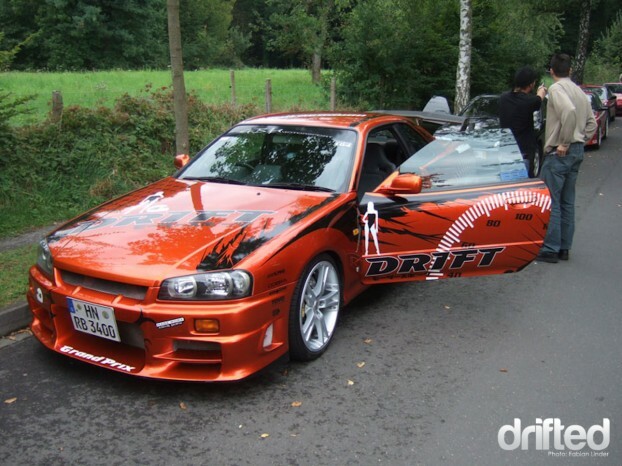 After all the time he spent on building the car, he felt the S15 was “his” show car, which represents his skills in engineering, so he decided to go for it all and build an uber-RB30. 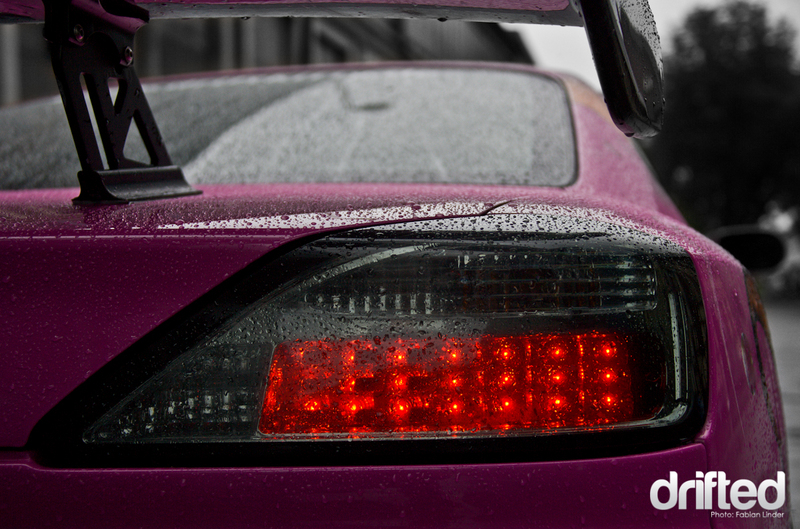 On the rear, they changed the stock taillights for LED Yashio Factory taillights. 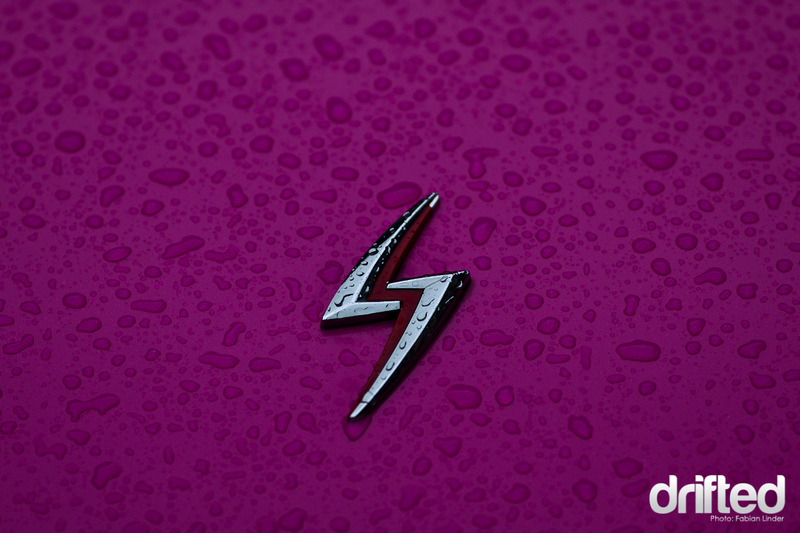 The taillights are modern and classy, a good choice. 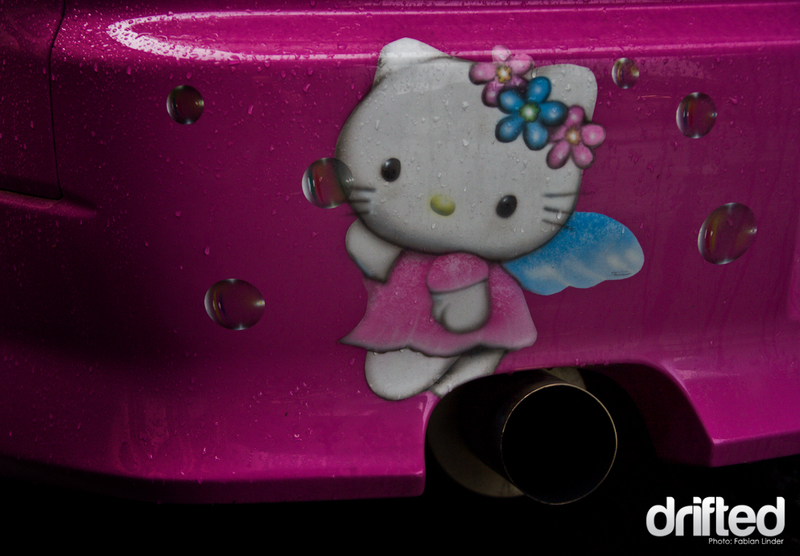 Hello Kitty looks out for small children who may want to climb in the GT-R exhaust. 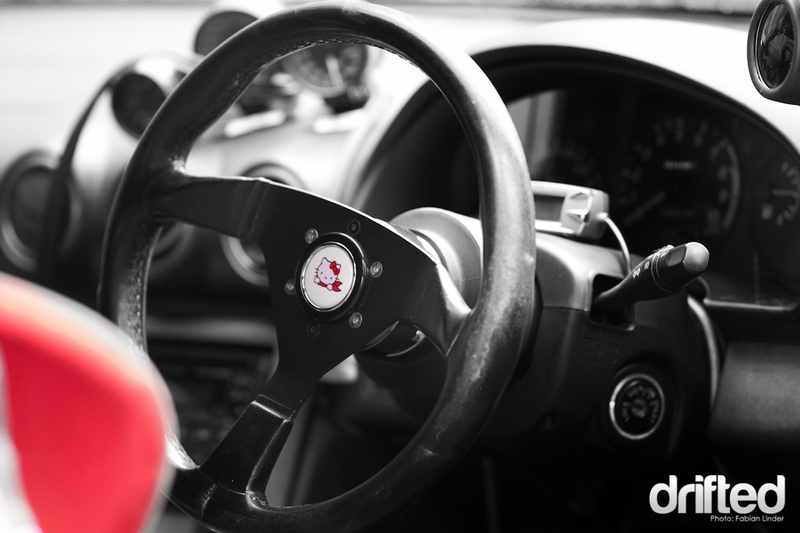 The first thing that was modified: the steering wheel with a Hello Kitty horn button. 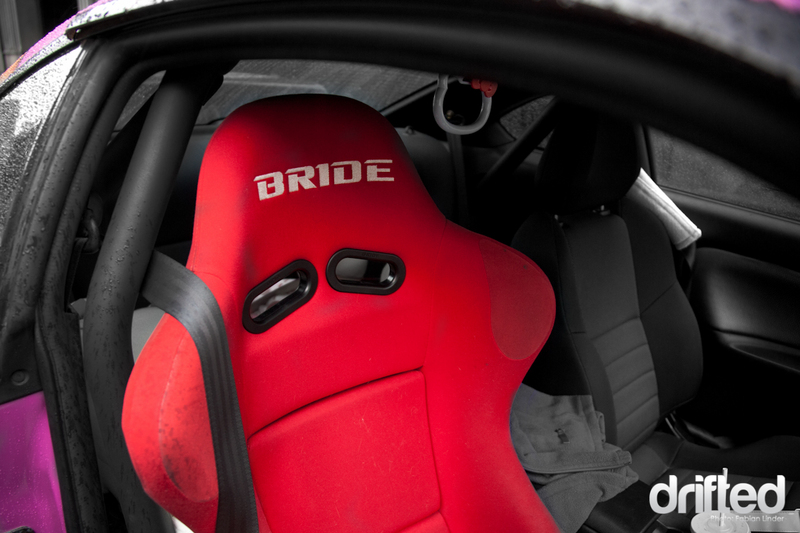 In the interior, form follows function: a Bride seat for Tasha and a stock seat for the passenger, although soon there will be two similar seats. Haters welcome: Tasha is proud of her car. 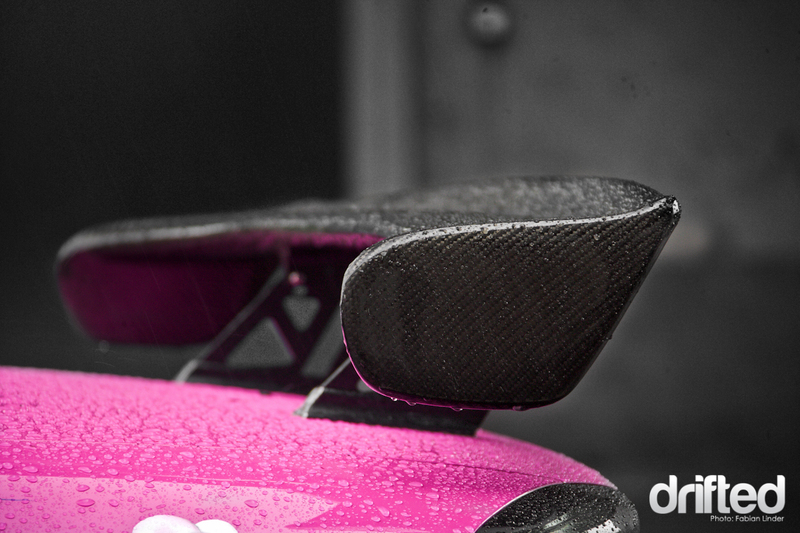 Modified to match the german law: the carbon fibre wing. 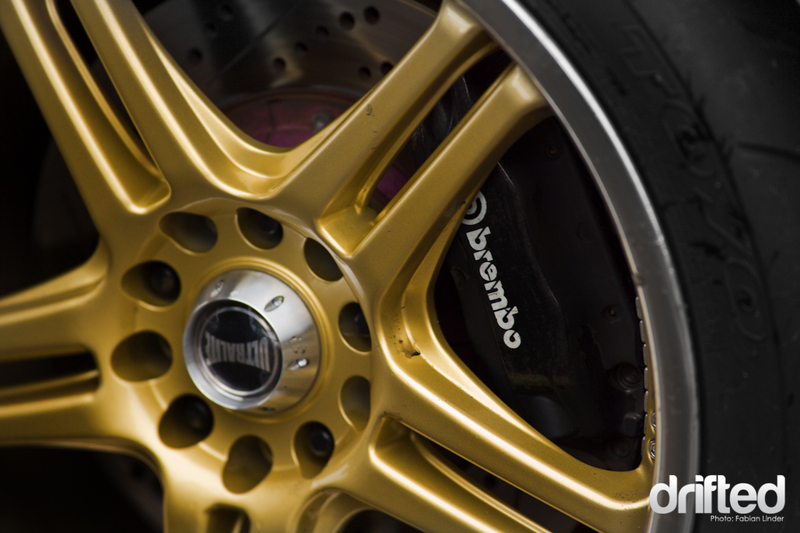 The Ultralite rims are great looking on the S, the braking system consits of Brembo, Nissan Skyline and Project Mu parts. 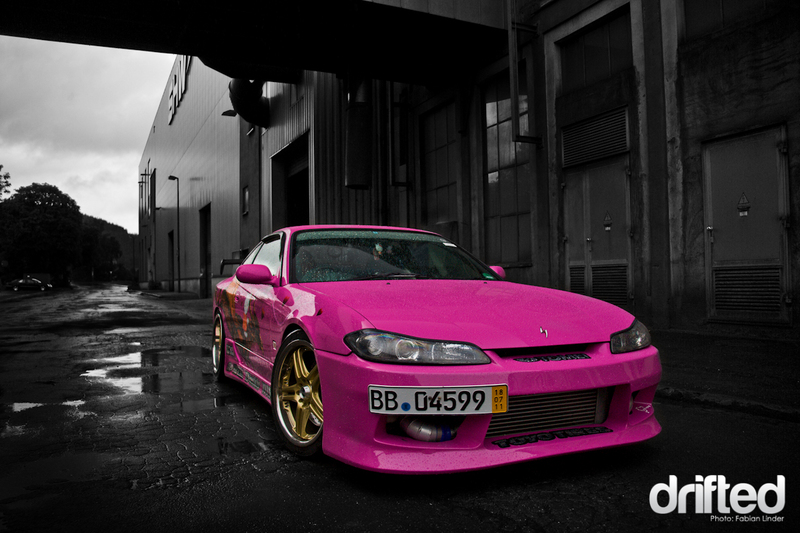 The “S” stands for “Silvia“, the S15 was the last car in the Nissan s-series: S12, S13, S14(A) and the S15. This Kitty can bite! 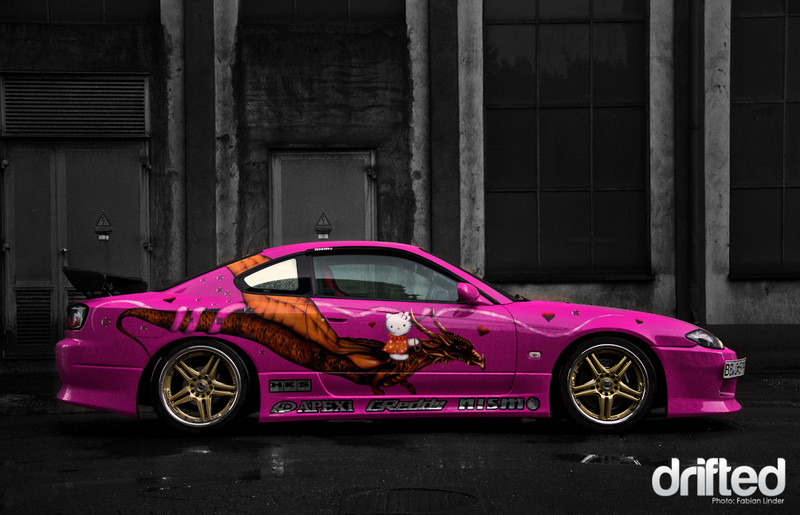 With around 500hp, its not as cute as it may look. The engine is now on a (very) low boost setup because the final mapping is still missing, but it already pushes 450 hp and 530NM. 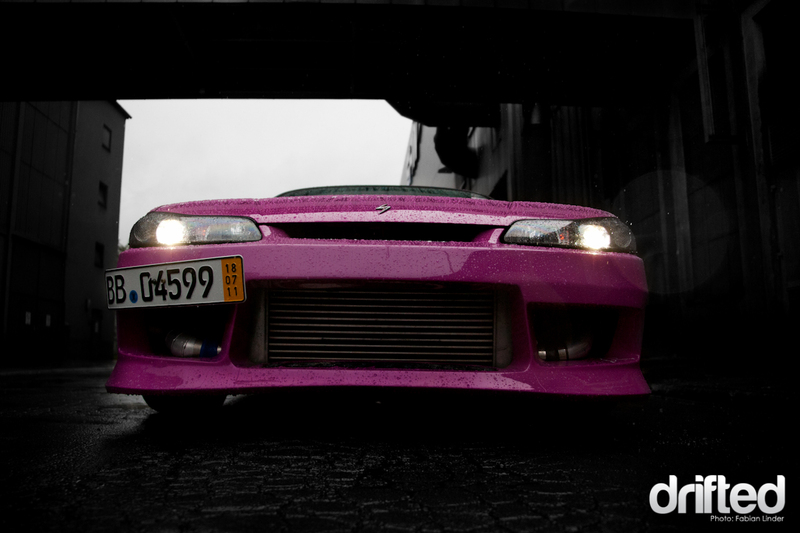 With the final goodies (bosch fuelpump, crank, new exhaust) and the mapping, it should be around 600+ hp.